This software package contains all of the following modules: Design Cooling Load, U-Value calculation and GBIS. Besides the modules above the Green Building Heating Package offers SOLAR-COMPUTER’s interface with AutoCAD MEP 2010 – GBIS. The entire heating concept for a project, including all its geometries, can be derived from drawings with only a mouse click. Furthermore, the interface is interactive and works in both directions. 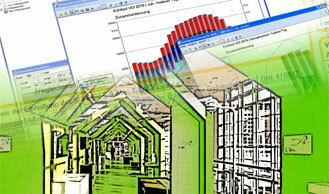 It incorporates changes made in AutoCAD as well as in SOLAR-COMPUTER software. The modular concept of all our software allows parallel working on different workstations with each individual module. Please use the following link to see our current market entry promotion to celebrate our arrival on the UK market. Follow the instructions and become a costumer or contact us directly for more information. For further discounts you can also become one of our preferred costumers.